It’s Mother’s Day, time to move the seedlings out into the big wide open garden and hope they do well on their own. 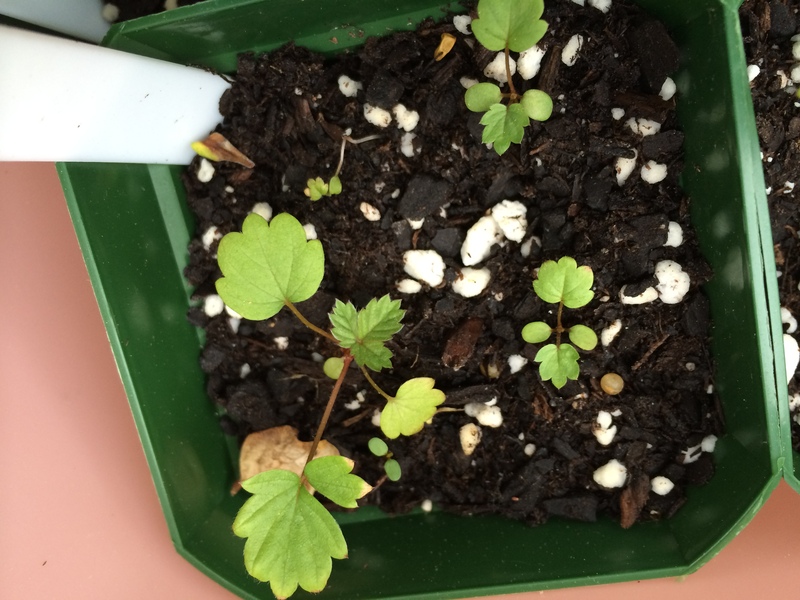 Cutting the apron strings for my Alpine strawberry (Fragaria vesca) seedlings has been hard though. For months now, I have been coddling them from seed, growing them under lights, hardening them off on the deck, and protecting them from heavy rains. I first read about them last year in Rosalind Creasy’s Edible Landscaping book, published in 2010. Although Rosalind lives in California, these small, fruit bearing plants seemed perfect for a typical suburban home in Northern Virginia. Coincidentally, my colleague in my garden club had just visited Switzerland and shared the packet she bought but it was too late in the season to start them. This year, Renee’s Garden is offering two types, a yellow fruited variety called Heirloom Pineapple and a red fruited variety called Mignonette. 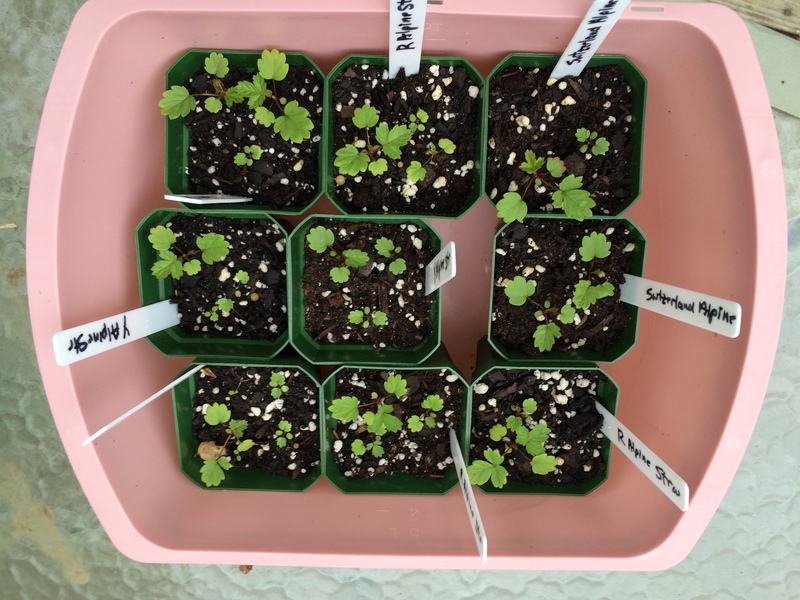 I started the Swiss packet and the two varieties from Renee’s Garden months ago, under lights, and surprisingly they germinated well but the seedlings were very small. After the true leaves appeared, I transferred them to small, plastic containers, still under lights. When the days warmed up in April, I put the tub of containers outside, and even then, only during the day time. Unlike regular strawberries, Alpine strawberries do not produce runners, are not as productive and have smaller fruit. Also known as fraise des bois, these are herbaceous perennials, hardy to my zone 7. They grow to a mound shape, about 8 inches tall, and prefer well drained soil high in organic matter. In my garden, I will give them morning sun and afternoon shade or dappled shade. I know it looks like I have a lot but I have read that birds like the fruit which hang above the plant like beacons – I am sure the devil squirrel will find them too. To deter such nonsense, I will plant them in various places around the garden and on the deck in containers. As a “have-to-have-it horticulturist,” I am the type who will read about a plant, buy it, and grow it without having actually tasted the fruit but I have read that the Alpine strawberries are even sweeter than grocery strawberries. According to the Renee’s Garden seed packets (the Swiss packet was not in English), the Heirloom Pineapple tastes like “delectable flavor of pineapples and roses” and the Mignonette has “ambrosial woodland flavor.” I am looking forward to this summer! This entry was posted in Uncategorized and tagged alpine strawberry, Edible Landscaping, Fragaria vesca, fraise des bois, Heirloom Pineapple, Mignonette, Renee's Garden, Rosalind Creasy. Bookmark the permalink.